Pictured above are the students in Anne Saliwonchuk’s Grade 5/6 class. In front, left-right, are Sadye Paluck, Elizabeth Warkentin, Kienan Hebert and Edward Sawan. In back, left-right, are Payge Hebert, Loreal Santos, Frederick Langdon and Teacher Anne Saliwonchuk. This reporter recently had the opportunity to share his experiences about the media industry with students in Anne Saliwonchuk’s Grade 5/6 class at Nampa Public School. Their teacher has been introducing them to media concepts such as freedom of the press and opinion pieces and they had questions for this reporter. One of their questions was, how many hours a week do reporters work? I told them that it varies, but it can be 40-plus hours a week. They also asked what I liked about my job and I said that I get to tell other people’s stories through my work. I also told them that the most important thing about being a reporter is that you have to love to tell other people’s stories, or you’re in the wrong line of work. That was one of the first concepts that I learned in journalism school. They also asked where I went to journalism school, which was at Thompson Rivers University in Kamloops, B.C. I encouraged them to check out TRU’s website for more information about the journalism program, and for other programs as well. Gradually the discussion turned to the copies of the Smoky River Express that I brought for them to look at. I noted that the newspaper requires not only stories, but ads as well, for the newspaper to run. They seemed keen to look through the pages, including the ones with school news on them. 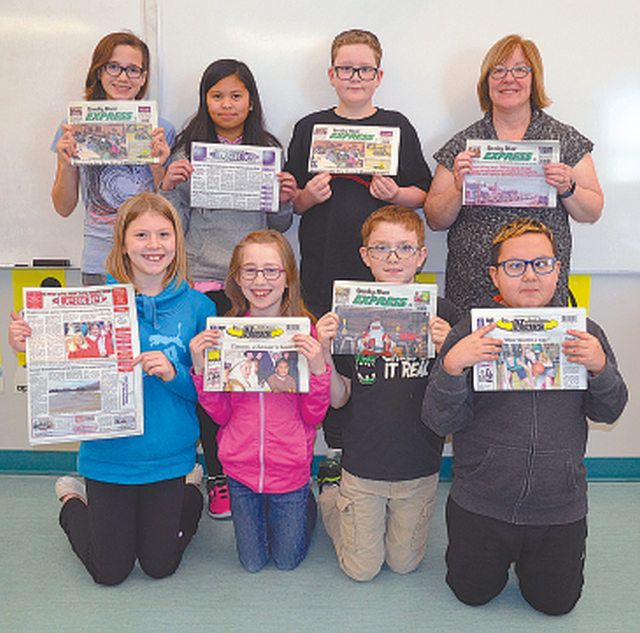 I brought copies of school news pages from around the region for them to look at as well, and I asked them if they would like to have their school news page in the Smoky River Express, and be the student reporters, and they eagerly nodded their heads. So, the Smoky River Express will have their stories in future editions. Other schools in the region will also submit their stories. The Nampa students are looking forward to putting their articles up on their school’s bulletin board. In other news, the school has their own archery program, which Principal Kevin Munch holds with the students in the gym every Wednesday afternoon.